After several days of freezing weather it was nice for the Shoreditch Street Art Tour to have merely “crisp” conditions on a bright clear day on Sunday. Not that a cold snap deters street artists, plenty of new street art was discovered on this morning’s tour and we start above with a beautiful paint spattered peacock on Brick lane pasted up by Bastek. Under a railway bridge Bastek also dropped this Ali G portrait intricately stencilled on paper, another preening peacock perhaps. Framed symbolism labelled Miah pleads “Fall in love with me”. Perhaps, but only for your art. And unsurprisingly Sell Out had been about creating topical trash sculptures and what could be fresher than a clone trooper just ahead of the next Star Wars movie. Bet clone troopers don’t feel the cold. This entry was posted in News and tagged Ali G, Bastek, framed, London, Miah, new, Paste-Up, Peacok, Sell Out, Shoreditch, Street Art on 11/23/2015 by Shoreditch Street Art Tours. Last night on our Night Street Art Photography Tour last night we came across the artist Sell Out creating a new structural installation making use of a street cleaner’s hand cart which is often kept in the car park. With a paint pot face, tape arms and hands propelling the cart around and butterflies streaming in the wind as its hair. We managed to get a few nice shots of the sculpture lit in a variety of different ways, night street art photography offers so much opportunity for experimentation. We had a pleasant chat with Sell Out who wasn’t at all fazed with the expected fate awaiting his new installation. This morning the Shoreditch Street Art Tour revisited the scene and found that the hand cart had already been re-assigned to its normal use and was no longer there. Such ephemerality is the almost inevitable fate of street art and we were pleased to be able to record this one’s mayfly like existence. This entry was posted in Artist, News and tagged dust cart, hand cart, London, Sculpture, Sell Out, Shoreditch, Street Art, street artist on 11/29/2014 by Shoreditch Street Art Tours. Yesterday afternoon the Shoreditch Street Art Tour found plenty of evidence that the Street art provocateur Sell Out had been out conjuring up new butterfly installations. The centrepiece of his latest installation isn’t actually a butterfly, it’s a multi coloured manically slobbering canine who is doggedly (boom boom) careering around on a scooter trailing a slipstream of butterflies in its wake. The tour also found that further up Brick Lane Sell Out had been active creating a beer swilling fixie riding skinny trousers wearing Shoreditch hipster out of a notice board on a wall. Hats off to an artist who works without permission in daylight, accepts members of public will collect souvenirs from his art and who yesterday happily signed butterflies for some of the younger members of the tour group! This entry was posted in Artist, News and tagged Brick Lane, butterflies, dog, installation, London, scooter, Sell Out, Shoreditch, Street Art on 09/22/2014 by Shoreditch Street Art Tours. 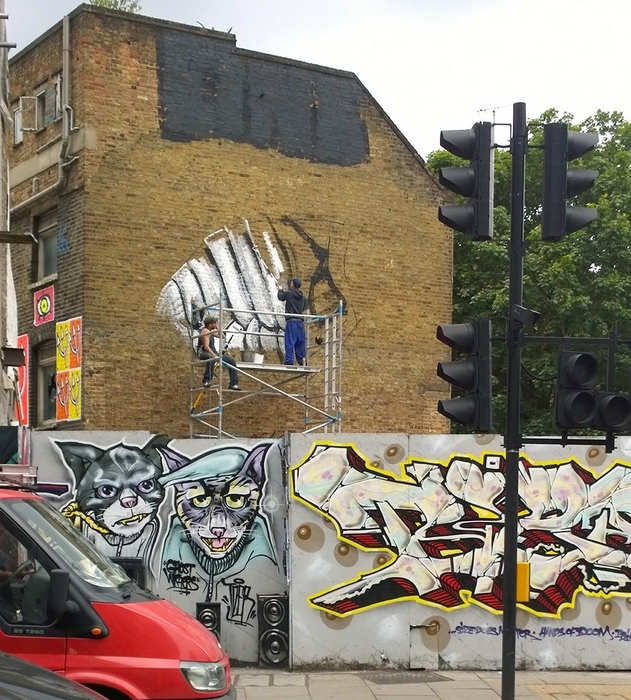 We have just had another exciting weekend of fresh new street art created by local and international street artists around Shoreditch this weekend and all of the pieces in this selection were seen as “work in progress” by guests of the Shoreditch Street Art Walk. Belgian artist ROA is in London for his tremendous new show at Stolen Space Gallery and on Saturday not even a mid afternoon downpour put off painting the stunning scary looking flea. Nearby, British artist Pure Evil continued his 1-a-day-for-365-days project with this stunning rampant flock of evil bunnies. The artist Sell Out played to the “3 Lions on the shirt” theme prior to England’s shock defeat to Italy with this little flotilla of butterflies on a Rolls Royce on Brick Lane (you read that correct!). We have seen street art on cars before but not quite like this before! Pedro Saci from Brazil got busy with a quick one on new hoardings, the structure of his work, particularly the way the mouth is done reminds me a lot of Mymo from Berlin who was here back in 2009. In the background you can see parts of the art by Cept (UK), Run (It), Faith47 (S. Afr), Mysterious Al (UK) and Rone (Aus). This busy weekend caused much excitement for the guests of the Shoreditch Street Art Tour! This entry was posted in News and tagged Graffiti, London, Pedro Saci, Pure Evil, Roa, Sell Out, Shoreditch, spraypaint, Street Art, Tour, Walk, walking on 06/16/2014 by Shoreditch Street Art Tours.